Astronomers using the NASA/ESA Hubble Space Telescope have obtained a remarkable new view of a whopper of an elliptical galaxy, with a core bigger than any seen before. There are two intriguing explanations for the puffed up core, both related to the action of one or more black holes, and the researchers have not yet been able to determine which is correct. Spanning a little over one million light-years, the galaxy is about ten times the diameter of the Milky Way galaxy. The bloated galaxy is a member of an unusual class of galaxies with an unusually diffuse core filled without any a concentrated peak of light around a central black hole. Viewing the core is like seeing a city with no center, just houses sprinkled across a vast landscape. 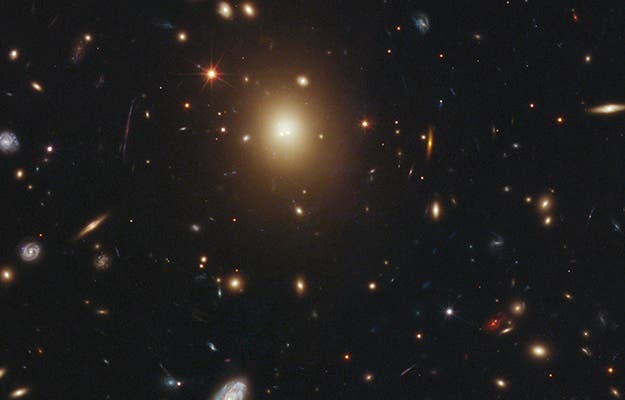 An international team of astronomers used Hubble's Advanced Camera for Surveys and Wide Field Camera 3 to measure the amount of starlight across the galaxy, catalogued as 2MASX J17222717+3207571 but more commonly called A2261-BCG (short for Abell 2261 Brightest Cluster Galaxy). 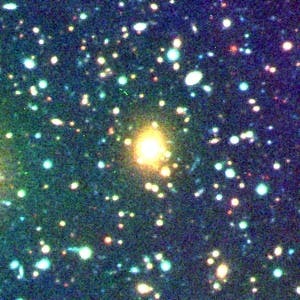 Located three billion light-years away, the galaxy is the most massive and brightest galaxy in the Abell 2261 cluster. The Hubble observations revealed that the galaxy's puffy core, measuring about 10,000 light-years, is the largest yet seen. A galaxy's core size is typically correlated with the dimensions of its host galaxy, but in this case, the central region is much larger than astronomers would expect for the galaxy's size. The bloated core is more than three times larger than the centre of other very luminous galaxies. Astronomers have proposed two possibilities for the puffy core. One scenario is that a pair of merging black holes gravitationally stirred up and scattered the stars. Another idea is that the merging black holes were ejected from the core. Left without an anchor, the stars began spreading out even more, creating the puffy appearance of the core. Previous Hubble observations have revealed that supermassive black holes, with masses millions or billions times more than the Sun, reside at the centres of nearly all galaxies and may play a role in shaping those central regions. "Expecting to find a black hole in every galaxy is sort of like expecting to find a pit inside a peach," explains astronomer Tod Lauer of the National Optical Astronomy Observatory in Tucson, USA, a co-author of the Hubble study. "With this Hubble observation, we cut into the biggest peach and we can't find the pit. We don't know for sure that the black hole is not there, but Hubble shows that there's no concentration of stars in the core." Team leader Marc Postman of the Space Telescope Science Institute in Baltimore, USA, said the galaxy stood out in the Hubble image. "When I first saw the image of this galaxy, I knew right away that it was unusual," Postman explained. "The core was very diffuse and very large. The challenge was then to make sense of all the data, given what we knew from previous Hubble observations, and come up with a plausible explanation for the intriguing nature of this particular galaxy." The astronomers expected to see a slight cusp of light in the galaxy's center, marking the location of the black hole and attendant stars. Instead, the starlight's intensity remained fairly even across the galaxy. One possibility for the puffy core may be due to two central black holes orbiting each other. These black holes collectively could have been as massive as several billion suns. One of the black holes would be native to the galaxy, while the second could have been added from a smaller galaxy that was gobbled up by the massive elliptical. In this scenario, stars circling in the giant galaxy's center came close to the twin black holes. The stars were then given a gravitational boot out of the core. Each gravitational slingshot robbed the black holes of momentum, moving the pair ever closer together, until finally they merged, forming one supermassive black hole that still resides in the galaxy's center. Another related possibility is that the black hole merger created gravity waves, which are ripples in the fabric of space. According to the theory of general relativity, a pair of merging black holes produces ripples of gravity that radiate away. If the black holes are of unequal mass, then some of the energy may radiate more strongly in one direction, providing the equivalent of a rocket thrust. The imbalance of forces would have ejected the merged black hole from the centre at speeds of millions of kilometres per hour, resulting in the rarity of a galaxy without a central black hole. "The black hole is the anchor for the stars," Lauer explains. "If you take it out, all of a sudden you have a lot less mass. The stars aren't held together very well and they move outwards, enlarging the core even more." The team admits that the ejected black-hole scenario may sound far-fetched, "but that's what makes observing the Universe so intriguing—sometimes you find the unexpected," Postman says. "This is a system that's interesting enough that it pushes against a lot of questions. Lauer added. "We have thought an awful lot about what black holes do. But we haven't been able to test our theories. This is an interesting place where a lot of the ideas we've had can come together and can be tested, fairly exotic ideas about how black holes may interact with each other dynamically and how they would affect the surrounding stellar population." The team is now conducting follow-up observations with the Very Large Array radio telescope in New Mexico. The astronomers expect material falling onto a black hole to emit radio waves, among other types of radiation. They will compare the VLA data with the Hubble images to more precisely pin down the location of the black hole, if it indeed exists. The Abell 2261 cluster is part of a multi-wavelength survey, led by Postman, called the Cluster Lensing And Supernova survey with Hubble (CLASH). The survey probes the distribution of dark matter in 25 massive galaxy clusters.